Ideal for use in harsh weather and high wind conditions. 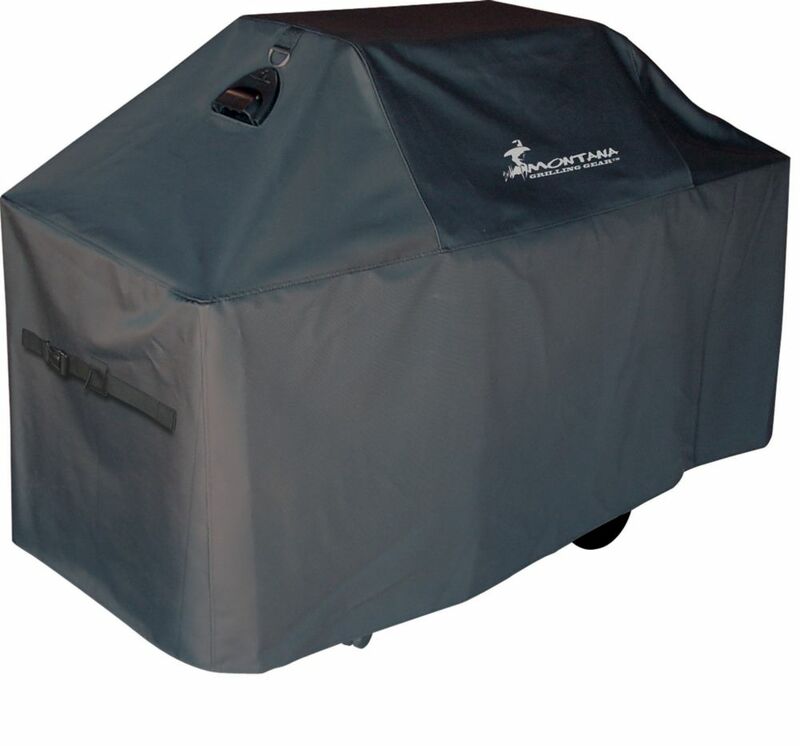 Duck Covers Ultimate Series grill covers are designed to protect BBQ grills from dust, dirt, sun, rain and heavy snow. Manufactured using a combination of high-strength polyester top panel, plus innovative, multi-layer, breathable side panels to help eliminate condensation. The multi-layer, breathable side panels eliminates the need for vents and provides additional cover height. High-strength polyester base for added durability. Mocha Cappuccino color. Two-year limited warranty has you covered. Provide year-round protection for your grill, with this Dyna-Glo Premium BBQ Cover. Made with water resistant, heavy-duty PVC shell and 900 Denier polyester lining to withstand harsh elements. Double-stitched seams provide additional strength and durability to help prolong the life of the cover. This cover also features durable nylon & rubber side handles for easily removing or handling the cover before and after use; Velcro adjustment straps for a customized fit and mesh side vents that provide much needed airflow for keeping the grill moisture free. Cover dimensions: 29.6" W x 23.9"D x 44.1"H (75.2 x 60.8 x 112.8cm). Fits all Dyna-Glo Small Space 2 & 3 burner gas grills, or standard gas grill with assembled dimensions of 28.5" W x 23"D x 45"H (73.5 x 58.4 x 114.3cm). Provide year-round protection for your grill with this Dyna-Glo Premium BBQ Cover. This premium cover is fabricated from water resistant, heavy-duty PVC shell and 900 Denier polyester lining to withstand harsh elements. Double-stitched seams provide additional reinforcement to help prolong the life of the cover. Includes durable nylon & rubber side handles for easy removal or handling of the cover before and after use. Velcro adjustment straps create a customized fit and mesh side vents provide much needed airflow to keep the grill moisture free. Cover dimensions: 64.0W x 26.0D x 48.0H (162.6 x 66.0 x 121.9cm). Fits most standard grills with assembled dimensions of 64W x 25.5D x 49H (162.6 x 64.8 x 124.4cm). Premium Innerflow Series 74-inch Ventilated BBQ Cover Superior protection for your barbeque from harsh weather and debris. This unique BBQ cover features the patented Innerflow System which prevents condensation from building up on your grill, while also keeping the weather elements out. The Innerflow vents also work as handles for easy removal. Made from a weatherproof heavy-duty vinyl/polyester material that does not crack or peel, and easily fits over your grill. Comes with tie down straps with a quick release buckle to keep it secure, and hanging rings for easy storage. The cover is also UV protected, and will remain mildew and fungus free.